This is obviously an opinion, so I won’t address that anymore, but Danganronpa 3 is hands down the best anime of not only this season. The character design is great, the animation work solid, the soundtrack brings chills down my spine, the writing is intelligent, the story is great and the unique format of bringing a Future- and a Despair-arc episode every week brings something very new. There is just one big flaw: I can’t recommend it to any of my friends, at all. First of all, shoutout to Drea-Poetic04, who also just posted a Danganronpa 3 article for the fans. But I’m here to tell newcomers, what this is all about and maybe give you a little nudge, to get into it, yourself. I advice against watching Danganronpa: The Animation. It might be okay, but most people I know of, who watched it without knowing the games, were just scared off from the franchise entirely. So what should you do? There goes no way, around playing Danganronpa: Trigger Happy Havoc and Danganronpa 2: Goodbye Despair. But both are really good games and on the bright side, it’s out on PS Vita and Steam. So you won’t need to rely on just one platform and jail-broken devices or emulators to play a fan-translation. No, you can just go to a local retailer and get physical copies for PS Vita or get some sweet deals on Steam or the PSN store. So most of us should be able to play it. If you still don’t know how, leave a comment below. If this is an absolute no-go for you, look at it from that way: I never played a visual novel before Danganronpa. I was scared off of the thought of so much reading. But it’s actually become pleasure food for me. Whenever I was too tired of playing a complex game, I instead decided to play Danganronpa. A game, that I can always pause and save. Every sitting automatically creates progress and with the good voicing and the option between English and Japanese (I recommend Japanese), it’s actually like watching a very good anime. If you really can’t bring yourself to try the first game at all, try watching the anime. Maybe it doesn’t scare you off, but you actually enjoy it. In that case, I advice you, to stop watching the anime and getting the game instead. If it’s too late and was just one long sitting, get the second game. The events at the end of the second end are really important. Will you need to read novels or get a PS Vita for that spin-off shooter? No. It will clearly raise your enjoyment and without them you will be at a loss for at least one episode of both arcs, but you won’t absolutely need to go that extra mile. I myself loved Ultra Despair Girls and even got the Platinum trophy for it. If you don’t have a Vita, you can also play it on a PSTV, which won’t cost you more than 30 or 40$. 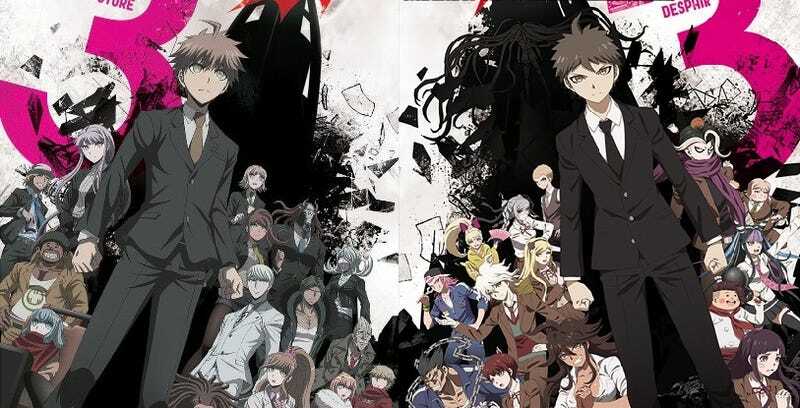 But the series clearly concentrates on the characters and story-line of Danganronpa 1 and 2. Another option to catch up are YouTubers. NicoB might be the one, who made Danganronpa popular in the west to begin with. So playing D1 and D2 and watching him play Ultra Despair Girls might be a good idea as well. I will keep on nagging all my friends, who don’t own a Vita, that Danganronpa 1 and 2 are out now for Steam. You can only lead a horse to water but you can’t make it drink. But if you like animes or Japanese stuff, this franchise is a must. If you like good stories, each and every entry in this franchise expands on a good twisted story, that capsizes typical story clichés and even uses them against your anticipations. If you like crime, good music or interesting character design, I can only repeat myself: This franchise is a must. What are your thoughts? Do you already know Danganronpa and came here just to talk about another crazy theory for the latest episode? Feel free to do so in the comments, but mark it as a spoiler. If you are new to the franchise or haven’t even heard of it before, tell me in the comments, if I was able to wake your interest.